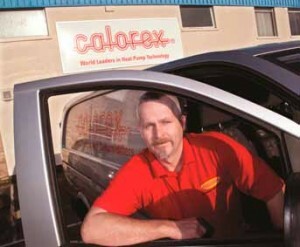 Calorex has a dedicated in-house service department and a national network of engineers. Underpinning its ongoing commitment to customer service and complete satisfaction, Calorex Heat Pumps, available through Certikin, continues to strengthen its in-house service department and long established national network of service engineers. At the heart of Calorex’s service operation is the dedicated support team ready to take calls and process and manage service enquiries, from the initial call right through to completion. Offering a comprehensive knowledge of the extensive Calorex range, the team is the first port of call for all customers with service and maintenance enquiries. The in-house team, based at Calorex headquarters in Maldon, Essex, work hand-in-glove with the nationally located ‘on the road’ squad that is capable of providing a speedy response to all corners of the UK. Calorex runs regular specialised service technician training courses, which provides attendees with onsite competence and product knowledge across the whole range of Calorex equipment. This is complemented by a vast array of spare parts held on Calorex service vans that often provide for a first time fix, even for equipment 30 years old.